Nothing says indulgence like a well-made scented candle. Here you'll find a wide selection of high-quality candle jars with glass lids that add a finished look to any candle creation. All prices include the accompanying glass lid with an attached plastic gasket for a secure fit. 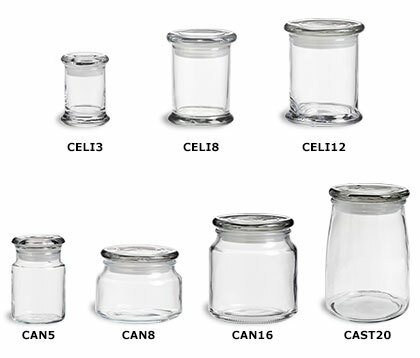 These jars are made of thick, heat treated glass and heavy bases for optimum toughness and safety. From just under three ounces up to our twenty ounce model, each of our candle containers also make an attractive display of candy or spices, and are great for reusable gift packaging.